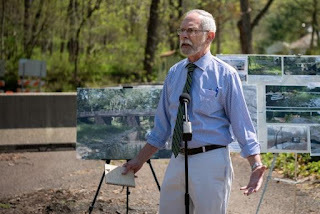 My favorite bridge – the Headquarters Road Bridge in Upper Bucks County, Pennsylvania – has to defend itself in court. The Delaware Riverkeeper (my client in this affair) is suing FHWA and PennDOT to prevent them from demolishing this 200-year-old one-lane bridge, which sits at the heart of a rural historical district, to replace it with a modern, two-lane structure. It’s sad to think that the future of this beloved little bridge couldn’t be determined through real collaborative planning. Or at least it hasn’t happened yet.